The concept of virtual reality, while seemingly so entrenched in the 21st century, actually spans several decades beginning in the 1930s. The evolution from science fiction fantasy to, well, a reality, is fascinating. This excerpt from the report “Virtual and Augmented Reality: Technologies and Global Markets,” provides a timeline of several important highlights. The concept of virtual reality dates back to the 1930s when “Pygmalion’s Spectacles,” a story written by science fiction writer Stanley G. Weinbaum, presented the idea of a pair of goggles that let the wearer experience a fictional world through holographics – three-dimensional images created with photographic projection, taste, smell and touch. Stanley’s description of the experience for those wearing the goggles is uncannily like the modern and emerging experience of virtual reality, making him a creative inspiration for the field. In the mid-1950s, cinematographer Morton Heilig developed the Sensorama, which was one of the earliest-known examples of immersive, multi-sensory (now known as multimodal) technology. It was a mechanical device that featured stereo speakers, a stereoscopic display, fans, smell generators and a vibrating chair. In 1960, Heilig’s Telesphere Mask became the first VR head-mounted display (HMD), providing stereoscopic 3D and wide vision with stereo sound. In 1961, two Philco Corporation engineers (Comeau and Bryan) developed Headsight, a television surveillance system incorporated with magnetic motion tracking connected to a closed-circuit camera and a video screen. Headsight was developed to allow the immersive viewing of an unpredictable situation by the military, but it was not actually developed for virtual reality applications. Headsight was the first step in the evolution of VR head-mounted displays, but the integration of computer and image generation was yet to be included. In 1965, Ivan Sutherland developed the Ultimate Display, a HMD system that could simulate reality to the point where one could not tell the difference between the real and virtual world. Sutherland’s concept included a virtual world that could be viewed through a head-mounted display and appeared realistic through 3D sound and tactile feedback. Computer hardware was used to create the virtual word and maintain it in real time, and users could interact with objects in the virtual world in a realistic way. In 1968, Sutherland, along with his student Bob Sproull, developed the Sword of Damocles, the first AR/VR device, which featured a head-mounted display that hung from the ceiling. However, this technology was closer to virtual technology than augmented technology. In 1969, a virtual reality computer artist, Myron Krueger, now considered one of the first-generation virtual and augmented reality researchers, developed a series of experiences termed as artificial reality, in which he developed computer-generated environment that reacted to people. His projects were Glowflow, Metaplay and Psychic Space and led to development of the Videoplace technology. The purpose of this technology was to enable people to communicate with each other in a responsive computer-generated environment despite being miles apart. Even after several changes in the development of virtual reality, the name was not used to describe the field until Jaron Lanier, founder of the Visual Programming Lab (VPL), coined the term “virtual reality” in 1987. Lanier, through VPL Research, developed a range of virtual reality gear that included the DataGlove and the EyePhone head-mounted display, which were major developments in the area of virtual reality. In 1974, Myron Krueger developed a projection system and video cameras called Videoplace, which produced shadows on a screen. It showcased the ability of being in an interactive environment for users. In 1990, the term “Augmented Reality” was coined by Tom Caudell, a Boeing researcher. Then in 1992, Louis Rosenburg, from the U.S. Air Force’s Armstrong Flight Research Center, created the first operative AR robotic system, which he called Virtual Fixtures. This was known as a premature version of today’s AR devices. In the early 1990s, virtual reality devices were commercially available, but the technology was still far too expensive for most people. The U.K.-based company Virtuality Group then launched a range of arcade games and machines with which players could wear a set of VR goggles and play on gaming machines with real-time immersive stereoscopic 3D visuals. In 1992, “The Lawnmower Man,” a science-fiction action-horror film directed by Brett Leonard, introduced the concept of virtual reality to a wider audience. A part of the movie was based on Jaron Lanier, the founder of virtual reality, and his early laboratory works. The actual virtual reality equipment from VPL Research labs was used in the film and the director, Brett Leonard, shared that he drew inspiration from companies like VPL. In 1993, Sega announced the Sega VR headset for the Sega Genesis console at the Consumer Electronics Show. The headset prototype had a head tracking device with wrap-around stereo sound and LCD screens. Sega intended to release the product at a price point of about $200 in 1993, which was equivalent to $322 in 2015. However, because of technical difficulties, the device remained in the prototype phase despite four games being developed for it. In 1994, Dancing in Cyberspace was the first theater production to use augmented reality. The theater presented acrobats on stage in and around virtual objects. In 1995, the Nintendo Virtual Boy, originally known as VR-32, was launched. It was a 3D gaming console that was promoted to be the first-ever portable console that could display true 3D graphics. The product was first released in Japan and North America at a price of $180, but it was a commercial failure despite price drops. The main reasons for this failure were the lack of graphics color (the games were only capable of displaying red graphics on a black background), lack of software support and difficulty using the console in a comfortable position. The following year, Nintendo discontinued its production and sale. In 1998, the 1st and Ten line computer system, which showed the original virtual yellow first down marker during a live National Football League game, was used by Sportsvision; this is now a norm in all televised football games and represents a significant phase of AR history. Then in 1999, NASA used AR technology to improve navigation through their X-38 spacecraft using a hybrid synthetic vision system. In 1999, Lana Wachowski and Lilly Wachowski, who are both American film directors, screenwriters and producers, directed the film “The Matrix.” The film portrays characters living in a fully simulated world, with many of them being completely unaware they do not live in the real world. “The Matrix” had a major cultural impact and brought the topic of simulated reality into the mainstream. In 2000, Hirokazu Kato, from the Nara Institute of Science and Technology in Japan, created AR software called ARToolKit. In 2009, ARToolKit made augmented reality available to Internet browsers. AR technology has come a long way since its early conception, and advancements in the past several years have been even more encouraging. The last 15 years have seen several significant advancements in the development of virtual reality and augmented reality technology. Notably, compact and powerful mobile technologies have increased in prevalence while prices have simultaneously decreased. The impressive growth of VR and AR in gaming and other applications has contributed significantly to the market over the last two decades. In 2014, the acquisition of Oculus by Facebook was a game-changer for the VR industry. 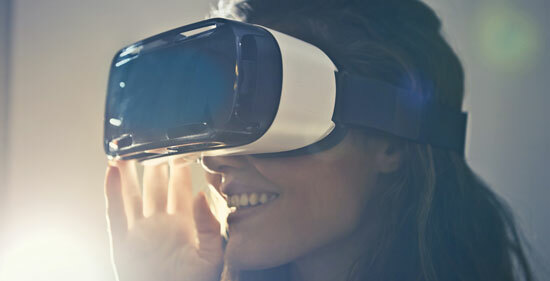 Major tech giants such as Google released interim virtual reality products like the DIY headset, which uses Google Cardboard and Google Daydream with smartphones. Companies like Samsung have taken this concept further with products such as Galaxy Gear, which contains smart features such as gesture control. It seems clear that the next few years will be key for the VR and AR industry. While these technologies have come a long way since their early conception, advancements in recent years have been even more encouraging.